Formerly known as French Somaliland (1883-1967) and renamed the French Territory of the Afars and the Issas (1967-1977), the colony took the name of Djibouti when it gained the independence from France in 1977. With a total area of barely more than 20,000 km2 (little smaller than the Italian region of Lombardy) and a population of approximately one million, the narrow and barren country is increasingly gaining global recognition thanks to its strategic location. Situated in the Horn of Africa and bounded by Somalia, Ethiopia and Eritrea, Djibouti is adjacent to the Gulf of Aden and the Bab el Mandab Strait, at the southern entrance to the Red Sea. The country, predominantly Muslim, represents a model of stability within an unstable and conflictual area. In a region of international tensions, the geostrategic location makes this tiny African nation an interesting laboratory for global actors to project their power and control the maritime route between Asia, Middle East and Europe. Indeed, through the Djibouti waters is projected the Maritime Silk Road, the maritime version of the Silk Road Economic Belt, that was proposed by Chinese President Xi Jinping in 2013 as a strategy to increment Chinese influence, foster investments and boost growth across the globe. The corridor is already central to the global commerce since 40% of the international shipping passes through the Bab el Mandab Strait every year, transforming Djibouti in a passageway to the Suez Canal and to the Western world. Furthermore, neighbouring Ethiopia is a landlocked state with no direct access to the sea and the narrow country represents its main port since around 95% of Ethiopia’s imports-exports pass through Djibouti. For this purpose and in line with the infrastructure plan involved in the One Belt One Road Initiative, China has financed and built the electric railway connecting Addis Ababa to Djibouti City and has installed a potable water project across the Djibouti-Ethiopia border spending around $300 million. China is nowadays the main commercial partner of Africa and since Ethiopia is considered the fastest growing economy of the continent, Beijing has every interest in investing and in exploiting the dynamism and productivity of the state. 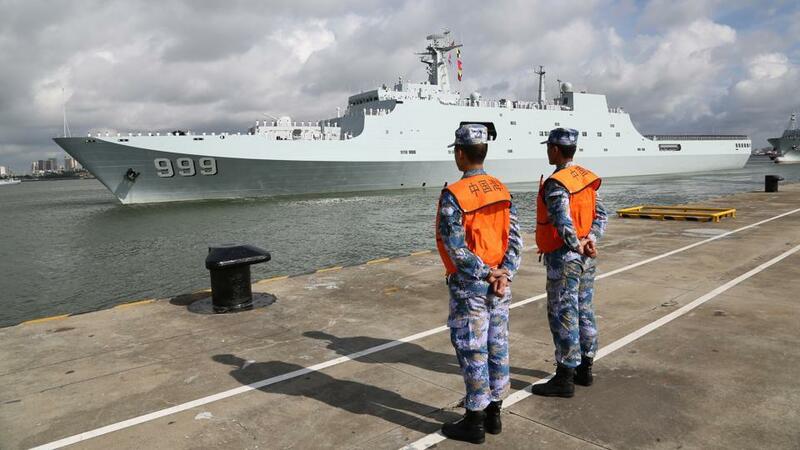 Djibouti has become an attractive spot even in military terms since in the past years the leadership has allowed some of the world’s major powers – United States, China, Japan, Saudi Arabia, France and Italy – to establish permanent bases in the territory. The proximity to wobbly countries in Africa and in the Middle East has highlighted Djibouti’s significance and despite the presence of other actors, the prominent powers do not renounce to exploit its strategic potential, using humanitarian and peacekeeping missions and counter-piracy operations as reasons of permanence. France, the former colonial power, has always maintained a strong military presence and has recently stationed a contingent of approximately 2.000 soldiers, the Forces Françaises Stationnées à Djibouti (Ffdj). It houses even troops of Germany and Spain but it is not excluded that Germany with its heavily export-oriented economy could in the foreseeable future build its autonomous military facility and be completely independent. Djibouti has become a military outpost even for Italy to celebrate national interests and for supporting UN peacekeeping operations and Gulf of Aden counter-piracy missions. Following the September 11, 2001 attacks, US established the only American installation on the continent in Djibouti called Camp Lemonnier primarily for supporting the Operation Enduring Freedom and for fighting terrorism in Somalia and Yemen through the involvement of African countries. Camp Lemonnier serves in addition as a platform for special missions with drones against ISIS. “Africa does not appear on the foreign agenda of the U.S. president-elect, Donald Trump, but as Djibouti, we had a good and deep relationship with U.S. government which I am hopeful will continue”, said Djibouti’s President Ismail Omar Gulleh. Instead, Africa appears on the foreign agenda priorities of the People’s Republic of China which is challenging and worrying the US giant since it has built its first overseas military base only within 18 miles from Camp Lemonnier. The advent of the Dragon’s ambitions in the region has materialized already in 2014 with investments in African aid of $175 billion against the $14 billion of the US commitment. The Chinese PLA Support Base is part of the One Belt One Road Initiative and even if Beijing justifies it simply as a logistics facility to pursue international obligations as humanitarian relief and stability promotion, the overseas base is expected to play a relevant role in China’s power projection in the Horn of Africa and, more generally, in Africa. In 2011, Japan has inaugurated the first overseas base since World War II in Djibouti next to the aforementioned Camp Lemmonier and it has been expanded in 2017 to secure Japanese shipping and trade and to counterweight the Dragon’s growing appetite in the region. 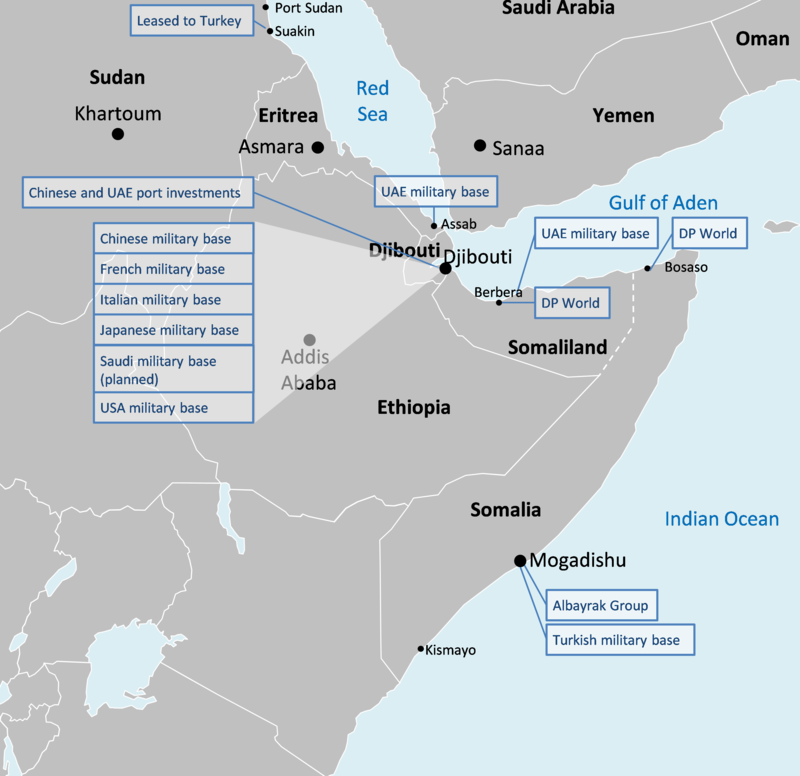 Other Sunni Arab countries like Saudi Arabia have recently expressed interest in the geostrategic location of Djibouti and the plan to establish a military base has been welcomed by the Djibouti Defence Minister Ali Bahdon. Riyadh wants to guarantee the security of shipping routes for its oil exports but undoubtedly such more assertive cooperation has the aim of opening up a new front to undermine the expanding clout of the Shiite-led Iran and a base to tighten the military operations in Yemen. Despite the unemployment rate of approximately 50%, thanks to the shipping route and the international investments, Djibouti business is booming and the competition would make the Horn of Africa always more attractive. And even if some experts are claiming a “scramble for Djibouti’s bases”, the political and financial incentives that have encouraged global actors to intervene are similar to those that have convinced Djibouti’s leadership to transform the country into a transhipment and military hub for major powers.